Starting in a depth of 2,500 metres we now plan to sample the concentration of iron in the sea at several stations, gradually working back towards the continental shelf. It might seem like an odd thing to look for, but iron is a vital nutrient to the microbial plants in the ocean. The plants only need it in minute concentrations, but in some parts of the ocean there is so little iron that the plant growth is inhibited. This was a big mystery in oceanography for a long time – there were areas where there was plenty of sunlight and plenty of the main nutrients (nitrogen and phosphorus, the sort of things you might give to plants in your garden), but very little growth of the ocean’s plants. Demonstrating that lack of iron was the problem took a long time because it is so difficult to measure iron without contaminating samples (for instance, with iron from the research ship). The CTD used to collect the seawater for iron analysis is entirely made of titanium and plastic, and the bottles on the CTD frame are always stored in clean conditions rather than being left on the frame as we do with the steel CTD. 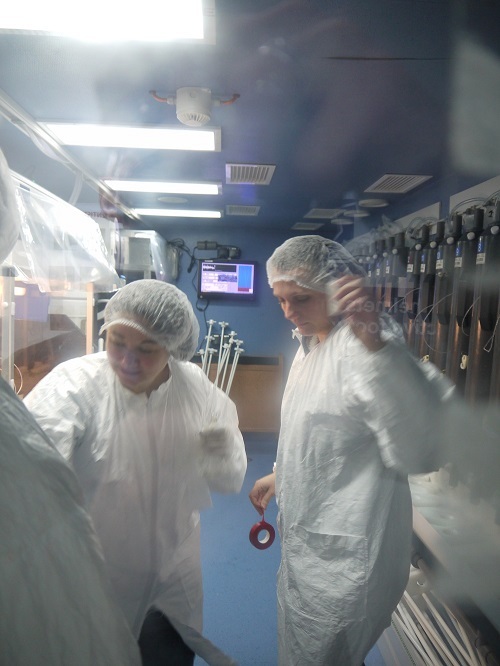 All of the iron analyses are done in a special clean chemistry lab on the ship, with the scientists having to wear very clean lab coast and gloves, and particularly attractive hats. Nobody is allowed into this lab without the right gear. Iron is not a problem for the microbial plants that grow in the shallow shelf seas. The reason we are sampling iron is that the continental shelves are thought to be sources of iron for the adjacent open ocean, possibly resuspended in sediments from the seabed of the shelf and the deeper waters of the shelf slope where we are now.